Click a column name to sort. Horizontal racks are made to fit dumbbells lined up in a row along the length of the rack. These are the most common type sold. They have 2 or 3 tiers, or shelves, to hold multiple rows of dumbbells. The shelves are angled down a little bit to facilitate easy access. These types of racks work well with any hex, 8-sided, or 12-sided dumbbells. The multiple sides on such dumbbells prevent them from rolling around, so the flat rack works great. Saddle racks are horizontal racks but also have saddles to hold each dumbbell. They’re made for round dumbbells that will roll out of place otherwise. The saddles are spaced apart, so these racks take up much more space than flat racks, but they are very user friendly. Any round dumbbells work well for these, such as pro-style, chrome, or round urethane dumbbells. Saddle style racks are frequently found in commercial gyms, because they look better, they’re easier to use, and they space out the weights so at busy times the customers aren’t climbing over each other to grab the right weights. Vertical racks save on floor space by stacking dumbbells up top of each other. Aerobic racks are meant to hold those small dumbbells used for aerobic and other light weight work. 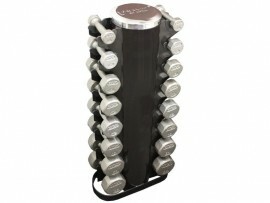 The dumbbells come in vinyl or neoprene styles, and both will fit these racks. 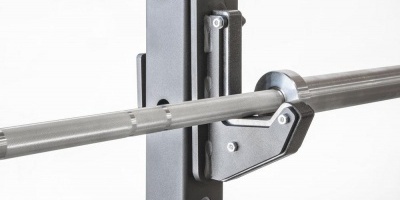 For flat racks we have denoted hex dumbbells for simplicity’s sake. You can also fit rubber coated, 8-sided, etc. These types of dumbbells start off with small heads, and their heads don’t reach full size until about 50 lbs. A flat rack that fits 5-50lb hex means it will fit pairs from 5lb to 50lb in 5lb increments (10 pairs) of hex dumbbells. When you go with larger sizes, the heads are all full width, so a rack that holds 5-50lb will alternatively only hold 50-75lb or 80-100lb. Technically you could get 3 of the 5-50lb racks to store a 5-100lb set, but you would be better off going with a larger, more stable rack that is made to take the weight better. The 5-100lb Troy TDR-3 rack is pretty cost-effective. Saddle racks are made to take any size dumbbells, but the number of saddles dictates how many you can hold. 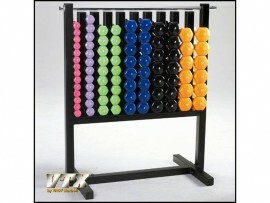 Vertical racks will hold only a certain number and certain size. 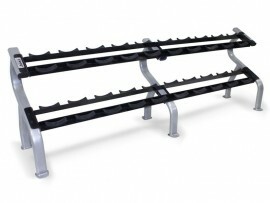 The Troy racks are made to hold 3lb, 5lb, 8lb, 10lb, 12lb, and then 15lb on up in 5lb increments. 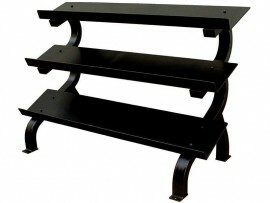 The York racks hold size 5lb and up, all in 5lb increments. You may be able to fit some other sizes, but this is what they’re designed for and may not take larger dumbbells because they will start hitting each other. Aerobic dumbbell racks vary. One type we have only fits a certain number, while the larger rack is more flexible. Tiers – This applies only to flat or saddle style racks. 2 or 3 tiers, or shelves. 3 tier racks are more efficient with floor space, but in a busy facility it’s a bad idea because people will constantly be in each other’s way trying to grab the right weight. Steel Gauge – The lower the number, the thicker it is. 14 gauge is ok but strictly for home use. 12 gauge is good and is 26% thicker. 11 gauge is considered commercial quality and is 12% thicker than 12-gauge. Even that 12% makes a big difference. 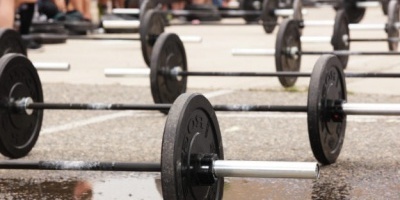 For more great articles on dumbbells, see our comprehensive list of dumbbell guides.